3000 plus trout per mile. 50 miles of riffle. The Madison River offers anglers some of the finest blue ribbon fly fishing in Montana. While the numbers mean the odds are always in your favor while fly fishing the Madison River, many first-time anglers are surprised to see the swift rocky waters of this classic western river and are often confused on how to fish it. Over the course of a Montana fly fishing season, our Montana fly fishing guides employ a variety of tactics to keep rods bent, nets wet, and anglers smiling. Dry fly fishing, nymphing, and streamer fishing all have their time and place on the Madison River. Understanding exactly when, where, how, and why to employ each is the best way to make your next Madison River fly fishing trip, your best yet. There is no greater joy as a fly angler than having a wild trout rise from the depths to eat a well-presented dry fly. And tough to imagine a better river for it to happen on than the Madison River. 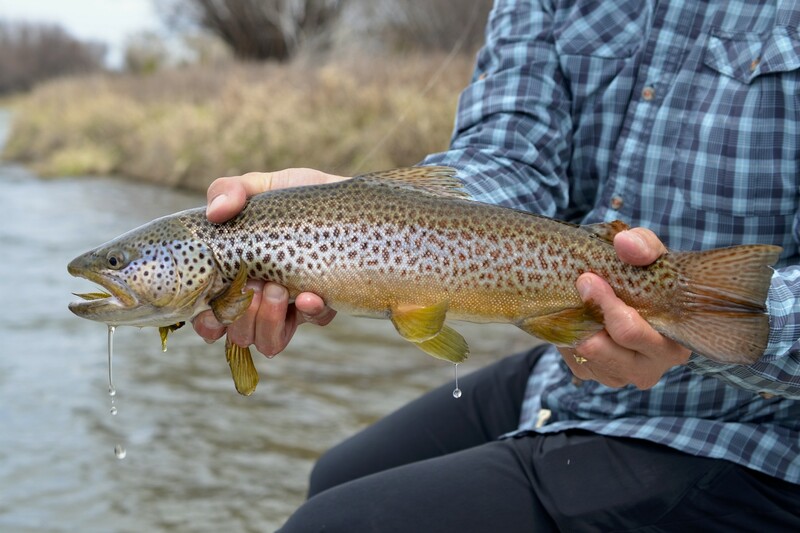 The many hatches of the Madison River means there are almost always trout to be taken on the surface on the Madison River. Dry fly fishing is the preferred tactic of many fly anglers and our Montana fly fishing guides. Salmonflies, goldenstones, caddisflies, PMDs, Yellow sallies, and terrestrials account for most of the mid-Summer dry fly action. BWOs and midges cover the shoulder seasons and winter. Presentation is everything when dry fly fishing. Good drifts will be rewarded. Because of the shallow depth of the Madison River, fish can be targeted all across, up and down the Madison River with dry flies. Generally the bigger the fly, the further the fish will move to eat it. Dead drifting is the preferred presentation for smaller flies, but giving some life to the larger stoneflies and terrestrials often triggers strikes from larger fish, especially out in the middle. Our Madison River fly fishing guides find float fishing to be the most effective method to fish the Madison River throughout the summer, but find wade fishing to be effective during the spring, fall, and winter, when the bugs are smaller and multiple drifts are often necessary to coax trout to the surface. Leader/Tippet: 0x for dry flies size 2 or larger, 1x for dry flies size 4, 2x for dry flies size 6, 3x for dry flies size 8-10, 4x for dry flies size 12-16, and 5x for dry flies size 18 and smaller. Tactic Specific: Good floatant is a must, The swift water of the Madison River means currents are constantly trying to sink your fly. Dropper nymphs work well tied off the bend of your dry fly if the action isn’t red hot. I would estimate that at least 90% of all trout caught every year on the Madison River are caught on a two-fly indicator rig. The trout on the Madison River love eating nymphs. The aquatic bug life on the Madison River is prolific, and there is always a healthy supply of nymphs available to trout, to keep them on the feed. You could fish a two-fly nymph rig every day of the year and expect to do well on the Madison River. But that doesn’t mean it is always easy. Weight, depth, drift, and fly selection all play important roles in angling success. And where you fish it. Targeting the biggest of rocks and significant changes in depth is a great starting point for finding fish on the Madison River across all tactics. Nymphing the edges, below, and in front of the biggest of rocks will consistently find trout. Mid-river drop offs are another always-likely spot. Fishing towards the banks is a great tactic when flows are higher earlier in the season, but look to the middle of the river as flows drop and the banks shallow. Early and late in the season, try and target the slower, deeper water. Deep and slow being relative terms on the Madison River. Generally if you find one fish, there are more. Rod/Reel: 9’ 5weight rods will cover 99% of all nymphing on the Madison River. A reel with a reliable and smooth drag is always recommended on the Madison River. Swift currents and large average size trout make for red-hot runs. Leader/Tippet: 0x for nymphs size 2 or larger, 1x for nymphs size 4, 2x for nymphs size 6, 3x for nymphs size 8-10, 4x for nymphs size 12-16, and 5x for nymphs size 18 and smaller. Tactic Specific: Lead or non-toxic tin split shot to get your flies down and fast. Start with a BB and adjust from there. Any indicator that floats well and you can see will work. We are of the belief that if you are nymphing you might as well use a Thing-a-ma-bobber type indicator. Trapped air technology works wonders. Fact: big brown trout on the Madison River love eating streamers. Streamer fishing on the Madison River is never about the numbers, but the best way to largest the bigger fish in these waters. Big flies, heavy rods, and thick tippet are the name of the game. Early season, late season, and overcast days during the summer are the best times for the best action. Many of our Montana fly fishing guides head to the Madison River with streamers in tow on their days-off in search of the trophy trout that live in this river. The trick to catching them? Putting in the time on the water and don’t be afraid to change. You can’t beat experience when it comes to streamer fishing on the Madison River. Color, time of day, conditions, time of year, weight of your fly, weight of your line, and retrieve all go into it. Generally olive and tan are the two stand by colors. Try darker flies on overcast days or when the river is off color and brighter flies on brighter days and cleaner water. But sometimes it is just about showing them something different. Classic smaller streamers will produce consistent action while larger, articulated streamers are commonly thrown when looking for the largest of trout. The great thing about the Madison River is that the fish can be hiding just about anywhere. Mid-river, the bank, boulders, dips, and dives are all possibilities. You’ve got to just keep casting to find them. Stripping and dead drifting can both work while streamer fishing. Don’t be afraid to keep changing until you get it dialed. Leader/Tippet: Floating lines: generally 9’ 0x leader or 6’ straight piece of 15lb Maxima for larger streamers. Sinking Lines: 2’ piece of appropriate strength Maxima leader material. 15-20lb for larger flies and 8-12lb for smaller flies. Tactic Specific: Fly line selection is key to streamer fishing success. Floating lines are standard, but it is good to have a variety of sinking lines on extra spools to get down fast in deeper holes. Full sinking lines are useful while wade fishing while sink tips are generally enough when float fishing.